Th-INK-ing of You: Peace, Love and Joy! Hello friends! I hope your week is going well! I have some oral surgery tomorrow and am trying to get things done today so just in case I'm feeling yucky afterward. Anyhoo... I do have a card to share that I created for this week's sketch challenge on SCS. I love this new paper that ODBD just released, called Christmas Paper Collection 2013. I used a coordinating stamp set called Sacred Season. This was one of my favorite sets from a past release, because I love pine cones! I collect them from all over the place! Lol! The base is Always Artichoke, sentiment panel is Very Vanilla, sponged with various distress inks. SB Deckled Rectangles were used to cut the sentiment panel, and the image stamp was colored with markers, then lightly colored with copics and sponged. Very CAS for me, but very mailable! This is so gorgeous, Grace! Love the natural background and wonderful sentiment! Good luck with your oral surgery. I am having back surgery Friday, so may not be around for little while. Hugs! Hi Grace!! Missed chatting with you today...I see you have been busy making cards!! This one is gorgeous!! I just love the pine to match the paper and your take on the sketch!! The snow on the pine and the deckled rectangles with the burlap is perfect!! Praying for you!! I know all will go well for your oral surgery tomorrow but I know how nerve racking it is too. HUGS!!!! This is lovely Grace - love the simplicity of the layout, which takes the eye straight to the sentiment. 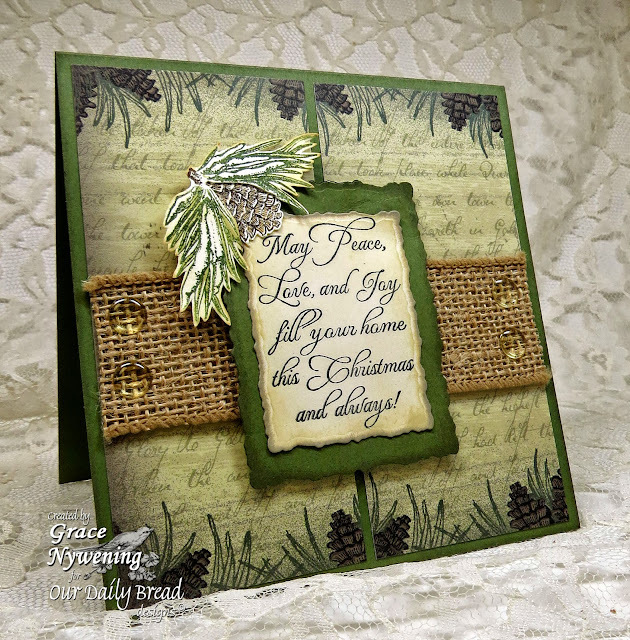 Wonderfully detailed background, and the texture of the burlap make for a stunning card. Hi sweet Grace...I LOVE your card, and can`t wait for my paper to arrive, I love what you did...its so Awesome! !...beautiful colours! This should be framed!! Wow!! Love the texture, the colors, and the whole design too! !